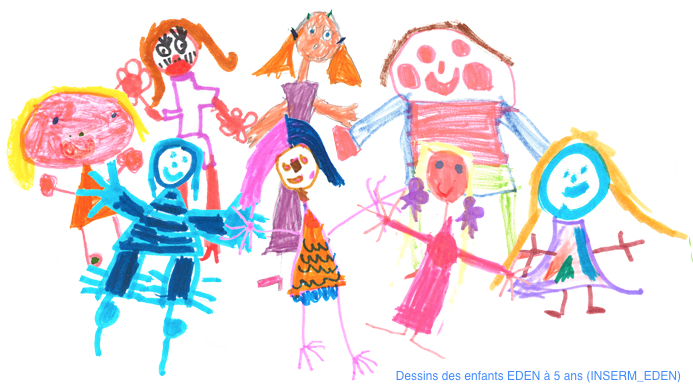 (Français) Atelier pratique: Apprivoiser l’anxiété ensemble en famille! 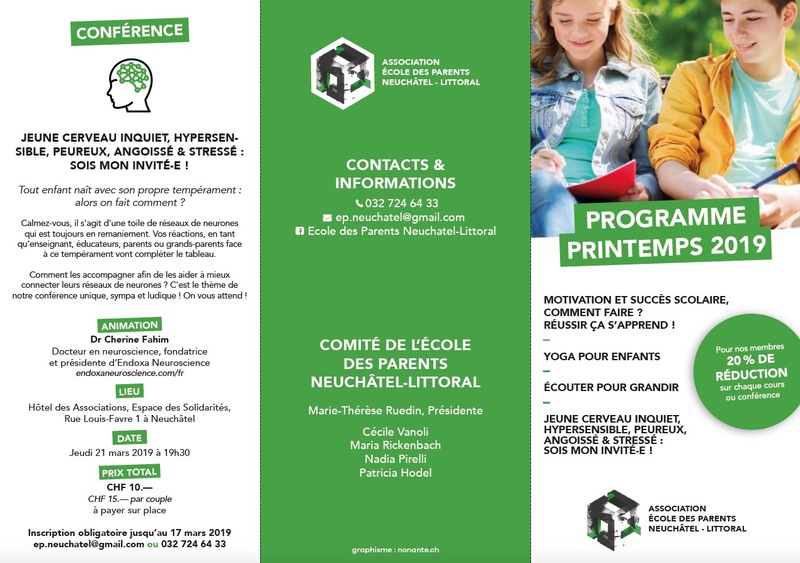 (Français) Jeune cerveau inquiet, hypersensible, peureux, angoissé & stressé: Sois mon invité! 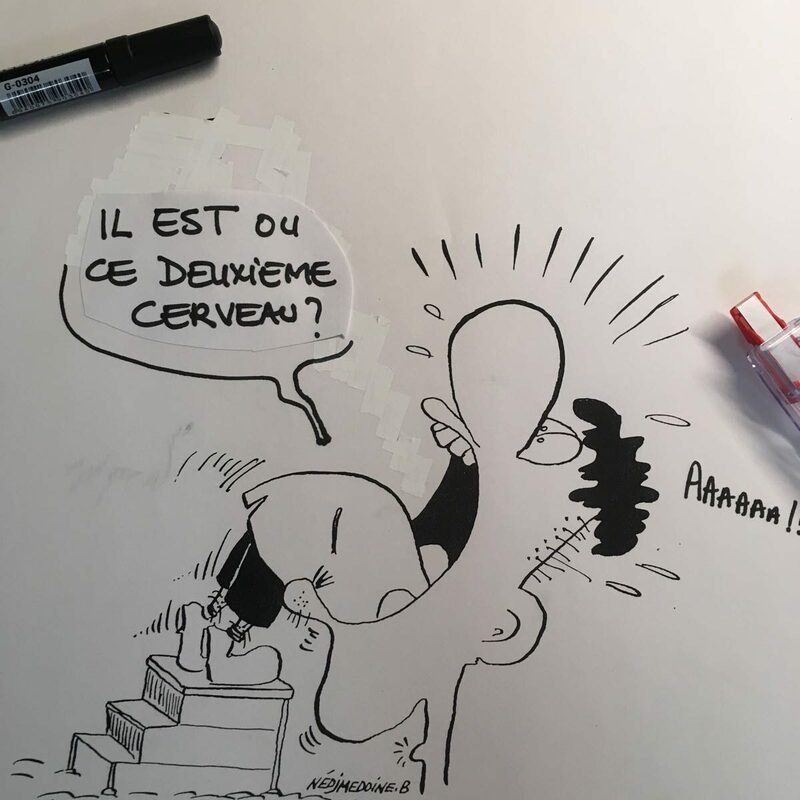 (Français) Il est où ce 2ème cerveau? (Français) C’est comme ça qu’on m’a élevé : comment le style d’éducation style le cerveau ! 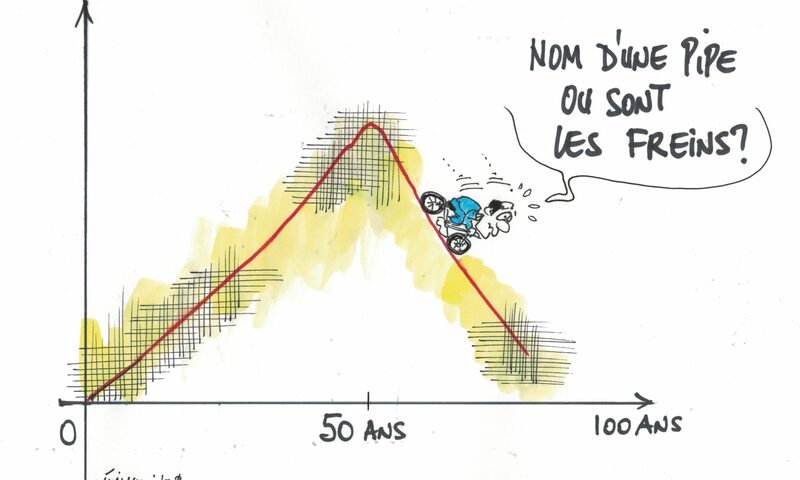 (Français) Nos Microbiotes = Nos Pensées ? 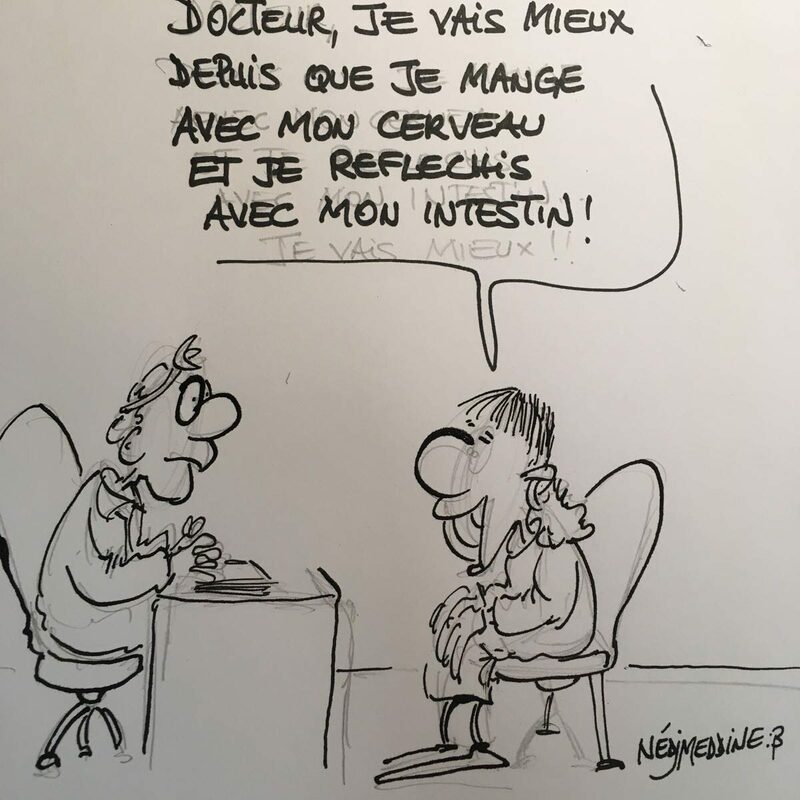 (Français) Cerveau dans la Tête, Cerveau dans le Ventre! 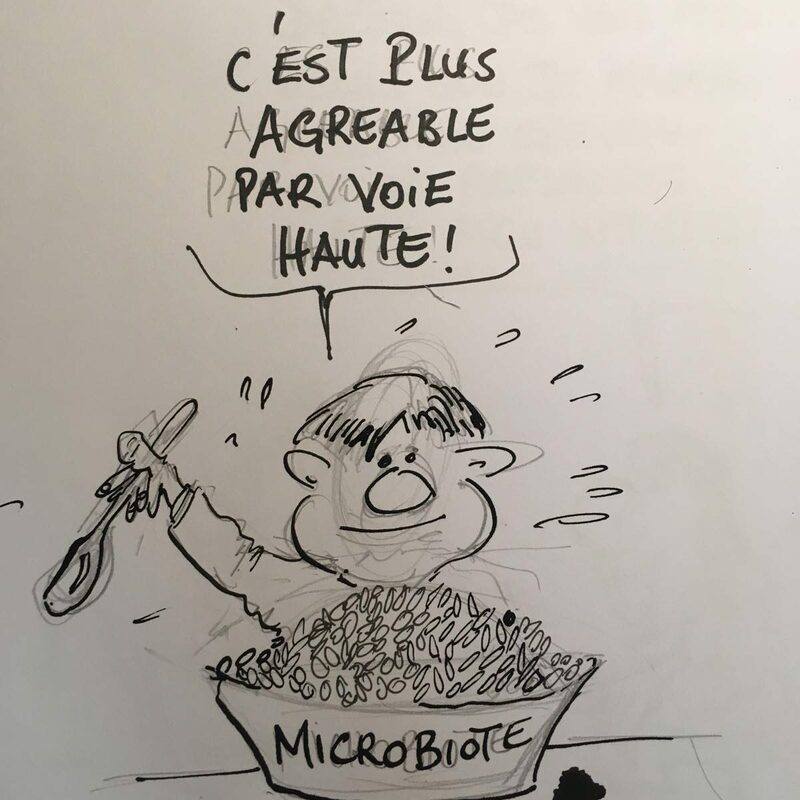 (Français) Le microbiome, le 2ème cerveau et nous! 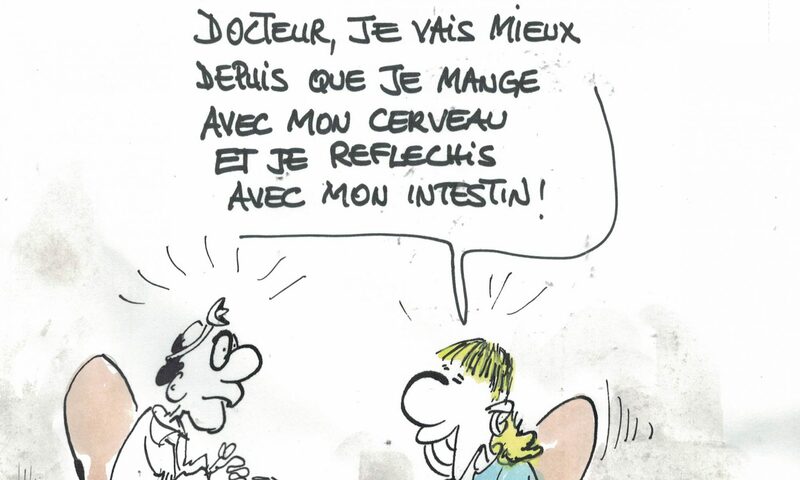 (Français) Attirer l’attention et faire bonne impression à l’ère du cerveau ! YES !!! During 5 days I have visited 8 primary and secondary schools in the Canton of Neuchâtel districts of: Cortaillod, Bevaix, Gorgier, Saint-Blaise, la Tène, and Neuchâtel Terraux (age range 6-15 years old). I planned 2 different powerpoint presentations adapted to the age of school students. 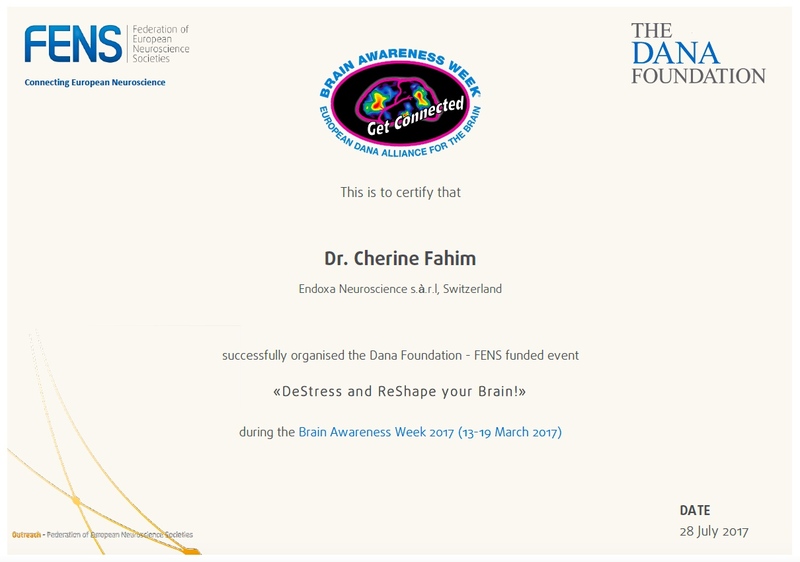 The first focused on introducing the neuron, brain and ADHD to primary school kids and the second presentation focused on brain development, anxiety and stress for secondary school kids. In addition to the powerpoint presentation, I have also prepared some hands-on activities like construct a neuron, or construct a brain with play doh. At the end of the presentation and activities the winners received a gift (either a rubber brain or a precious stone). 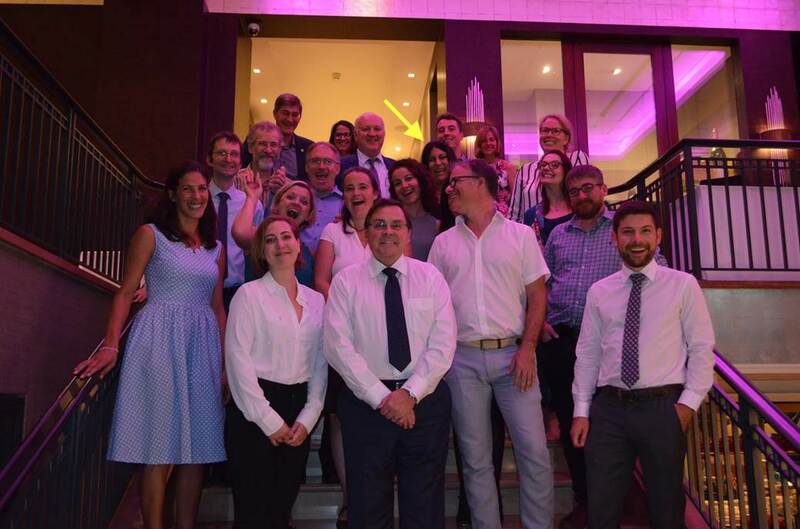 This 5 days plan was built on a strong belief that a new approach is needed: a structured but flexible model that facilitates neuroscience/brain knowledge development and implementation into health promotion and prevention as early as possible targeting school age children and adolescents. more about what it is that is shaping their brains. I have received very good feedback from teachers acknowledging the importance of such an event. Our target was to let them learn what is the brain, what is shaping it for better and for worth. The objective of the DeStress and Shape your Brain workshops is to foster understanding of anxiety, stress, ADHD from an entertaining neuroscientific view so that these children-teens are prepared to prevent and manage stressful situations now and in the future. Most importantly, I have accompanied them into understanding that they can re-shape their brains. 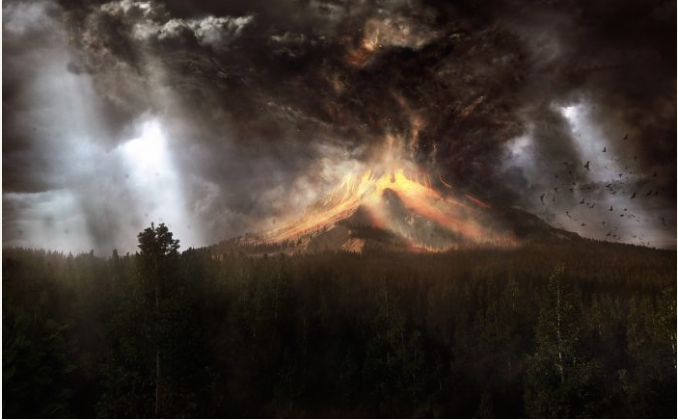 The D disorders: When a Volcano erupts! It is homework time, somewhere, in September. “Alex!” His mother calls. “Stop watching TV and please come do your homework.” Alex doesn’t reply. His mother repeats her request twice. Without even glancing at her, Alex continues watching his cartoon. Her voice is as ephemeral as the sound waves that carry it to Alex’s ear. His brain is mesmerized by the colorful cartoon. After the third time, he turns up the volume of the TV. Noticing her mother’s exasperation, his older sister switches the television off. Alex scowls at her and throws the remote control, striking her on the forehead. “Alex! That’s enough! Now go to your room.” In his room, Alex knocks over a chair and throws down the homework that was lying on his desk. It might be homework time, or bath time, or dinnertime. Suddenly, a child explodes in response to a parental demand or comment. It is a critical situation that can lead to anxiety, frustration, and even despair on both sides. Facing such situations on a regular basis causes significant impairment within the family sphere and interferes with social activities, school, and work. Families suffer; teachers describe children as disobedient and unruly; neighbors call them spoiled brats; pediatricians/psychiatrists diagnose them with disruptive behavior disorders (DBDs), also known as the D disorders. D disorders are one of the most serious public health problems facing society today. They comprise (1) oppositional defiant disorder (ODD), typified by anger, severe non-compliance, and defiance; and (2) conduct disorder (CD), which is characterized by aggressive/cruel behaviors deliberately aimed at harming people, as well as by property loss or damage, deceitfulness or theft, and frequent lying. Typical of those with D disorders are a shallow affect, impulsivity, and a lack of remorse, empathy, and self-regulation. How can you regain control of a situation that has got out of hand when you have difficulty activating your brain control regions? Recent research using magnetic resonance imaging has demonstrated that compared with healthy 8-year-old children, children with ODD display a significant reduction in the density of gray matter (GM: contains neurons, which are the main cells involved in cellular communication) in the left orbitofrontal cortex (OFC), a key prefrontal region that plays a pivotal role in emotional self-regulation and impulse control. In contrast, they show an increase in the left temporal area, which has been found to be associated with aggressive, impulsive, and antisocial personality traits. These structural abnormalities present some evidence for the existence of neuropathology in ODD during childhood, and may contribute to the pathogenesis of this disorder. The real problem is not Alex, but rather his brain’s functional and anatomical dysregulation. The OFC is crucially implicated in the behavioral inhibition system (BIS) and in the regulation of socio-emotional behavior in settings requiring social affiliation and social judgment, as well as self-awareness, inhibition, and the management of behavior through judgments and decisions about one’s actions. This brings us back to the image of Alex thoughtlessly throwing the remote control and hitting his sister in the head. His BIS should have kicked in and told him to answer his mother, turn off the TV, and go do his homework. It should also have prevented him from throwing the remote control. However, it didn’t. In our role as parents and/or health professionals, it is our job to help Alex activate his OFC to control the situation, think about moral judgments, and feel empathy. There is no magic formula for educating an ODD child. However, there is general agreement on the concept of applied behavior analysis (ABA), formerly known as behavior modification, as a means of guiding children’s behavior. ABA is based on the principle that reinforcement and punishment shape behavior; reinforcement promotes behavior repetition, while punishment discourages it. One straightforward application of this principle is found in cognitive-behavioral training. 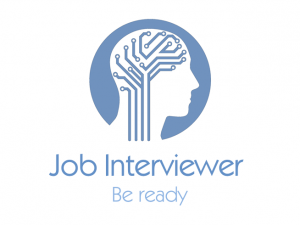 Cognitive training is currently the subject of considerable discussion. 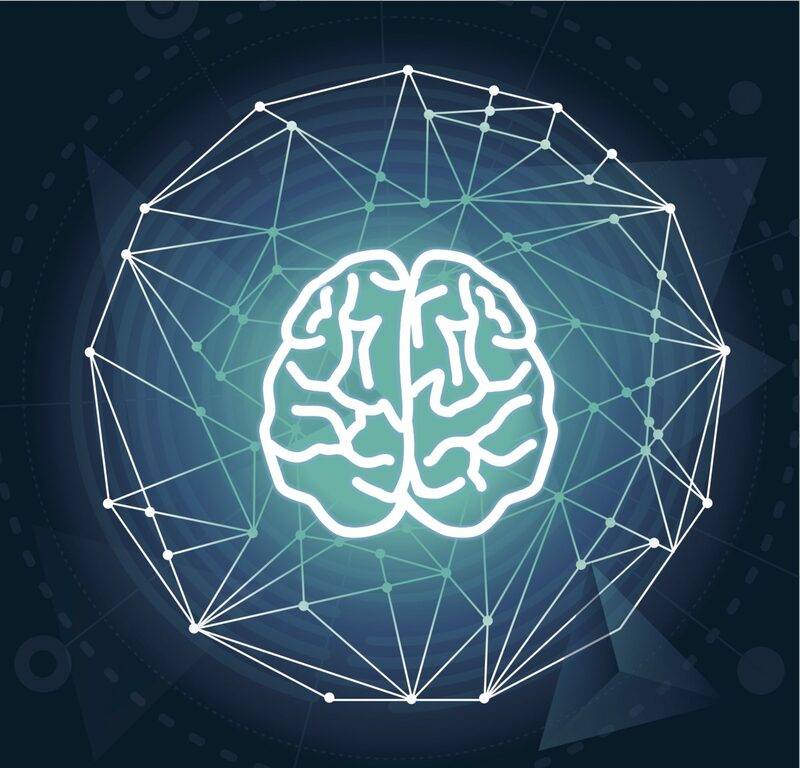 It is an expanding field, with methods ranging from simple cognitive neurocoaching to neurofeedback and, more recently, brain-computer interface (BCI) applications. It often involves computerized training programs, which are particularly appealing in the computer age, especially for children. Increasingly complex programs have been developed to improve behavioral function and combat distorted thinking. Since it promises to promote attention and self-control skills, behavioral training may be a particularly appealing non-pharmaceutical alternative for treating ODD children. When parents and teachers find themselves in a frustrating situation with a child suffering from a D disorder, they need to avoid becoming upset and arguing with the child. If they are mindful of cognitive training paradigms, based on knowledge of the brain’s functions and anatomy, they may be able to help children like Alex activate their OFC and experience a sense of inner peace. Over time, with encouragement, these children may learn to do this on their own.